MK Bennett at the Conference of Presidents: There's a considerable common denominator between us and Yesh Atid. Bayit Yehudi Chairman MK Naftali Bennett denied on Tuesday that Prime Minister Binyamin Netanyahu had offered him the position of Education Minister in the new government, as Israeli media outlets had reported. 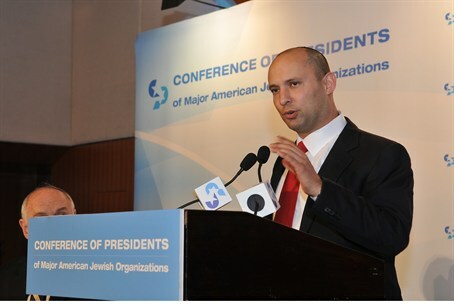 Bennett, who answered questions during the annual gathering of the Conference of Presidents of Major American Jewish Organizations, said, “We’re not yet talking about jobs or positions. The coalition structure is unclear as of now, and the first question is who’s in the government and the next question is who does what. “Certainly, it’s a very vital job but there’s no progress yet,” he added. Bennett said there was a “considerable common denominator” between his party and Yair Lapid’s Yesh Atid on things such as the economy and getting hareidim involved in Israeli life. Israel has a very rare opportunity, said Bennett, to bring about an equal share in the burden of army service while not hurting the world of Torah study. “The Torah world is vital for Israel. Torah is the reason that we are here. We can’t give that up,” he said. Earlier, Bennett gave a speech to the participants at the annual gathering.